- Alton, Cole, and I met up with Kat and her German Shepard Murphy at the Hale Brook Trail for a quick hike up Mount Hale. 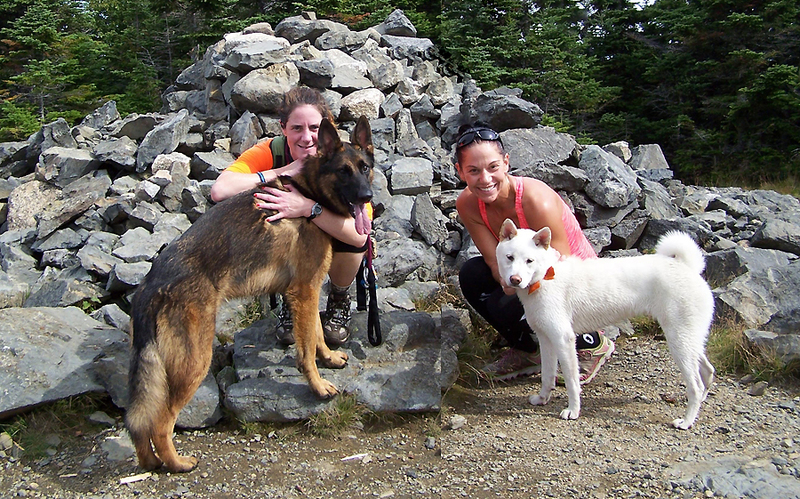 - Cole and Murphy had a fun time running up and down the Hale Brook Trail. The Hale Brook Trail isn't an exciting trail, no views and it's in the woods the whole way so it was fun to have the dogs around to entertain us. The trail is never steep and the footing is good compared to most trails so it's a easy hike for bagging a 4,000 foot summit. - We took a nice long break on the summit enjoying the open but wooded summit where the fire tower used to be before heading down back to the car. - At the car, Kat and Murphy took off, while Alton, Cole, and I headed to the Sugarloafs. - The Sugarloafs are a great hike for families. It's a 3.4 mile hike with great views from the open ledges on the summits of both Middle and North Sugarloaf. The trail is in great shape and easy to follow and should be checked out if you are thinking of trying out hiking for the first time! Cole walking softly and carrying a big stick!